It comes with three rigid splints – one fixed splint contained in a pocket on the center back and two side splints with Velcro backing which allows them to be positioned as needed for optimum effectiveness. The splints ensure both support and stabilization of the fractured limb throughout the healing period prescribed by your vet. The brace is designed for daily use, thanks to the breathable fabric that prevents blisters and sores caused by sweating. When using the BT Bone brace, we recommend combining it with the BT Joint, because its use on the healthy joint will help the dog compensate better for the added load caused by the loss of use of the fractured leg. Once the brace has been placed around the dog’s leg, it is not necessary that the two white-trimmed edges meet, since the closure of the brace is by means of the blue straps and stabilization is provided by the three splints contained in the brace. During the period of restraint, it is recommended that the dog not be left alone very long because it could try to remove the brace by biting or scratching it. Remove the splints before every laundering. Available in six sizes, all adjustable in width thanks to the breathable velvet straps that allow the brace to be enlarged or tightened. Note: the weights indicated are purely indicative. If in doubt, rely exclusively on the size measurements in cm indicated below. 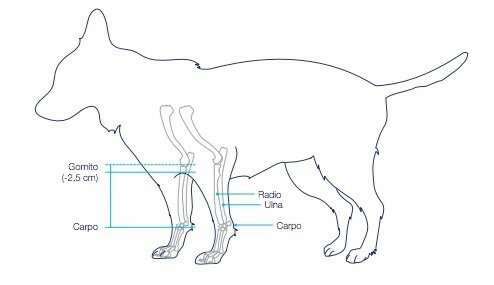 With an accurate measuring tape, measure the length of the front leg (from the carpus to 2.5 cm below the elbow) and compare it with the size chart on the right.